We can all agree that life without the Internet is very dull. But there’s something even worse than that. Life with bad Internet. Every time you want to watch a movie, it buffers for half an hour every ten minutes. When you enter a gaming session, you lag and die without knowing why. This is why we created this list of the Best Modem Router Combo in 2018. After thorough researching and testing, we came up with a list of 7 modem routers. You won’t have any problems watching a movie or gaming if you use them, and you can buy them right now. Why Would You Need A Good Modem Router Combo? Where Should I Place My Modem Router? How Do I Install My Modem Router? How Long Will My Modem Router Last? Does My Modem Router Need Updating? Using separate devices as a modem and a router is a thing of the past. There is no need to do so when you can use a device great at doing both tasks. Even though some of them don’t look like much, all the following products were good enough to pass all our tests and end up on the list. Without further ado, here are the 7 best modem router combo devices in 2018. Some of you who might wonder why there isn’t any 32 band modem router included in the list. Well, here is the answer. DOCSIS 3.0 because it wouldn’t be efficient for them to use more. There is a new speed update in testing, but it’s supposed to hit the market at the end of 2018, at the earliest. It’s more likely to reach the end consumers in 2018. It will be called DOCSIS 3.1, and it will only be available for premium services. At the moment, buying a DOCSIS 3.0 device that has more than 16 channels is not recommended because it’s not likely to provide any advantages. However, we included the NETGEAR Nighthawk AC1900, which has 24 channels because it’s very good overall. As you can also see in the review, we recommend this device only to people who have very fast Internet plans. This is one of the best modem router combos available on the market in 2018. If you buy this unit, you will be able to use 3 different technologies. A 16×4 cable modem, a 4-port Gigabit router, and a Wi-Fi router. 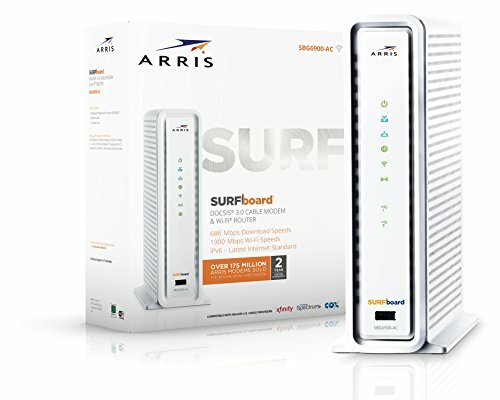 The Arris SURFboard was first launched in 1997, and people are still buying it today because it’s reasonably priced, efficient, and easy to install. The cable modem benefits from the DOCSIS 3.0 technology, which is 16x faster than the older 2.0 version. This modem can reach download speeds of up to 686 Mbps, upload speeds of 131 Mbps, and it offers 16 separate download and 4 upload channels. The modem supports both IPv4 and IPv6, and it’s compatible with all the major Internet cable providers registered in the U.S., so you won’t have any trouble setting it up. The Wi-Fi router supports transfers speeds of up to 1,900 Mbps, and the Arris beamforming technology will deliver focused Wi-Fi signals to all the stationary devices, maximizing the effectiveness of the transfer. The wireless router has an 802.11 AC standard which is faster than others, but its download speed is capped at 686 Mbps, and the upload speed at 131 Mbps. The Wi-Fi router performs well on both the 2.4 gigahertz and the 5 gigahertz bands. This SURFboard router modem combo has 4 Gigabit Ethernet ports on the back, allowing you to connect to different devices using a cable. You can use the WPS button to quickly create a connection between the router and wireless devices. Ceritified on Comcast Xfinity, Cox, Spectrum (Charter, Time Warner, Brighthouse Networks), Mediacom and many other US Cable Internet Providers. Requires Internet Service. 2 year warranty with US based customer service. Refer to the Quick Start Guide and Installation video.Router is AC1900 dual band WiFi with 4 Gigabit Ethernet ports. Great for streaming HD Videos and gaming. The ARRIS modem router combo is a reliable device you can use for gaming. It provides a fast and stable connection to the Internet, so you won’t have any lag issues. It uses a dual band Wi-Fi, so you can connect multiple devices to it without altering its performance. 16 Channels - The 16 download channels will allow you to connect to your ISP without worrying about local congestion at peak times. Very High Speeds - This unit is capable of delivering download speeds of up to 686 Mbps and upload speeds of 131 Mbps. No Lag Or Buffering - You won’t have any problems with lag or with slow video buffering if you use this router. The high speeds and large number of channels will create a stable and efficient connection. Overkill - Even though it’s great to have a modem router combo able to deliver high download and upload speeds, most people won’t reach them. Bright LED Lights - We’re not in the habit of judging a device by its design unless there’s something very good or very bad about it. The problem with this router modem combo is that the indicator LED light are very bright. Make sure you place the router somewhere it won’t bother you at night or cover the lights. This is one of the cheapest modem router combos you’ll be able to find in 2018. Even though it’s reasonably priced, this is an efficient product for most users with an Internet plan up to 150 Mbps. The modem is compatible with most Internet providers in the U.S., and installing it is a breeze. The cable modem router benefits from the DOCSIS 3.0 technology and has 8 download and 4 upload channels. The modem can reach download speeds of up to 343 Mbps, and upload speeds of up to 143 Mbps, depending on your cable provider service. It has 8 downstream and 4 upstream channels, so it will establish a stable connection even during peak hours. The Wi-Fi traffic can reach up to 300 Mbps on a 2.4 gigahertz ​band. There are 4 Gigabit LAN ports on the back of the modem. There is also an USB 2.0 port you can use to share multimedia files in your network. The great thing about this device is the software. You can customize the bandwidth allocated to every device, so you can prioritize your favorite devices. The video streaming on your smart TV is lagging your gaming console? No problem, just prioritize the console and the larger bandwidth will make your connection faster. You can also use the router’s software to create a separate Wi-Fi for your guests, so they won’t be able to access the other devices in your home’s network. A Parent Control setting will manage how different devices can access the Internet. The TP-Link N300 modem router combo is a great choice for the average user. If you usually spend your time on social media or watching movies, and your Internet plan is not larger than 150 Mbps, this is the device for you. Great For Usual Users - If you use the internet just for browsing, social media, and the occasional gaming session or movie stream, this is the right product for you. Intuitive Software - This product uses a simple and intuitive software. You will be able to install the modem in a few minutes, and you can easily change its settings. Firmware Needs Updating - Make sure that one of the first things you do after connecting this unit to the Internet is a software update. If you don’t update the firmware, you might experience some random restarts. 2.4 GHz Signal Only - This unit will emit a single 2.4 GHz Wi-Fi band. This can cause connectivity problems if you use many Wi-Fi devices. This is the highest rated modem routers combos on Amazon, and it proves once again that Motorola is still capable of developing very good products. 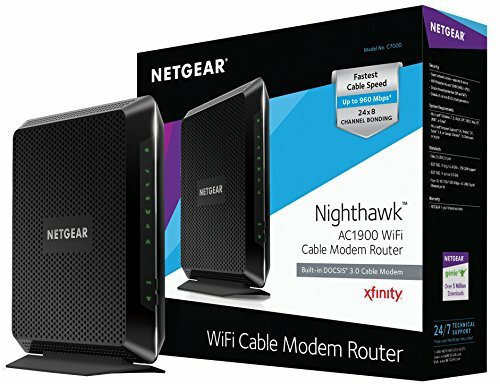 Even though this product doesn’t have the flashy design or additional features other models have, it will deliver exactly what you want: a fast stable connection to the Internet, and a reliable Wi-Fi network. The modem is certified by most cable Internet providers, so you will have no problems using it. The modem uses the DOCSIS 3.0 technology, and it can provide download speeds of up to 686 Mbps, depending on your service. It has 16 downstream and 4 upstream connections, and it will create a fast and stable connection even during peak hours. The built-in Wi-Fi router connects at both 2.4 and 5.0 GHz bands. In addition, the Wireless Power Boost feature will amplify the wireless signals to the legal limit. This will provide a boost in both speed and range. The AnyBeam feature will focus the Wi-Fi signal delivered to your wireless devices to increase the performance. This modem also provides 4 Gigabit LAN connections for Ethernet devices. 16x4 DOCSIS 3.0 cable modem plus a built-in AC1900 Dual Band (2.4 GHz and 5 GHz) Wi-Fi Gigabit Router with four Gigabit (GigE) Ethernet ports, a firewall, and more. This product is recommended for actual cable Internet service speeds up to 375 Mbps. A Broadcom cable modem chipset provides security from Denial of Service attacks. Wireless Power Boost adds high-performance Wi-Fi power amplifiers to boost the wireless signals to the legal limit, giving a significant boost in speed and range. In addition, AnyBeam beamforming at both 2.4 GHz and 5 GHz frequencies focuses the signal on wireless clients to further enhance performance and range. The Motorola MG7550 modem and Wi-Fi router combo is one of the best devices available in 2018. 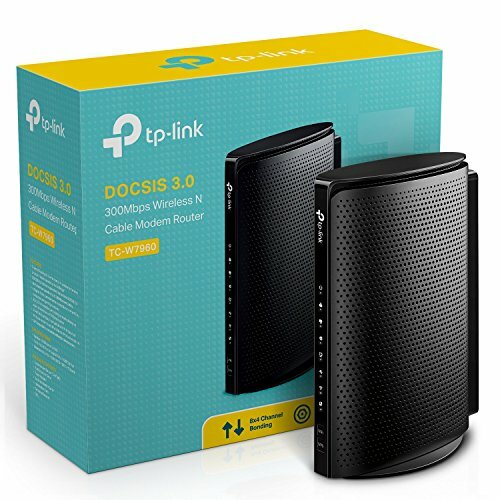 It comes with the broadest connection available for the DOCSIS 3.0, and its wireless booster really improves performance. Wi-Fi Booster - This feature will increase the speed and range of your Wi-Fi network. AnyBeam Feature - This feature will focus the Wi-Fi signal for increased performance. Close Ethernet Jacks - The Ethernet jacks are placed close to one another on the back of the modem. This can be a problem, but only if you want to use all four at the same time. This modem router combo is a great solution if you have to stream or upload media frequently. The 24 download and 8 upload channels will create a fast and stable connection at all times, no matter how many people are using the ISP network at the same time. It uses DOCSIS 3.0 technology, and it can provide a download speed of up to 960 Mbps. The Wi-Fi router can create both 2.4 and 5.0 GHz bands, so you won’t have any problems connecting multiple devices at the same time. The Beamforming technology will focus the Wi-Fi signal delivered to your devices, increasing their performance. There are 4 Gigabit ports on the back of the modem you can use to connect to Ethernet capable devices. An USB 2.0 port will allow you to share media with the entire network. One of the best features of this device is the NETGEAR genie app. The app will make the installation process extremely easy, and it will also allow you to monitor and control the network from a remote device. The app is Mac, Windows, IOS, and Android compatible. This device is perfect for people who have a fast Internet cable service. It’s a good choice for people who upload a lot of data and stream media online because the wide channel bonding will maintain a fast and steady connection even during peak hours. The NETGEAR Nighthawk AC1900 modem router is a great choice if you have to upload a lot of data frequently. It comes with a broader connection than what the DOCSIS 3.0 usually uses, but this may help if you have a fast Internet plan. Great App - This modem router comes with a great app. You can use it to monitor and control the network from a remote device, and to quickly transfer files within the network. It also makes the installation process very easy. 24 x 8 Channel - This device uses 24 downstream and 8 upstream channels to establish a broad connection to the Internet. The connection will be fast at all times. Channel Bonding - This is a new technology which allows you to reach unprecedented speeds. You can reach up to 900 Mbps, depending on your Internet plan. Might Be Too Much - This device is designed to work with fast Internet connections. If you don’t have one of the fastest connections currently available in the U.S., using this modem might not be necessary. This is a reliable modem router most people can use. While it’s not as efficient as other models, and it doesn’t have many high-end features, this device will provide a good Internet connection for an average user. The modem uses the DOCSIS 3.0 technology and has 8 download and 4 upload channels. The modem has a top download speed of 343 Mbps, and an upload one of 123 Mbps. The modem is both IPv4 and IPv6 compatible. It is certified for use by most Internet cable providers in the U.S., so you will be able to use it without problems. The Wi-Fi AC 1900 router is compatible with both 2.4 GHz and 5.0 GHz bands. The Any Beam technology is used to focus the signal for every wireless client, even if the receiving device doesn’t use a beam forming technology. The TurboQAM technology is used to boost the wireless performance, and it can increase the data transfer by up to 33%. This router modem combo is great if you want a stable and fast connection. The dual Wi-Fi band can make a real difference if the 2.4 GHz one is crowded in your area. The Zoom Telephonics AC1900 modem router is a good choice if you want to buy an efficient device at a reasonable price. Even though it’s not as famous as other manufacturers, this company managed to produce a good device for all around use. Turbo Feature - The Wi-Fi router uses a Turbo feature which will increase the performance and range of the device. Beam Forming Technology - The beam forming technology will create better connections between the router and the wireless clients. Bright LED Lights - The router uses bright Ethernet lights. This can be a problem for some people. Poor User Instructions - The User Guide could be improved. Some of the instructions are difficult to follow. This modem router is designed for VDSL/ADSL connections only. It is compatible with most of the DSL Internet providers, but make sure you check out the manufacturer’s website before purchasing to see if the device is compatible with your service. The modem is very easy to install. If it is compatible with your ISP, all you have to do is connect it to the phone line. Once connected, an auto-detection software will get you online in a matter of minutes. The router uses a dual band Wi-Fi able to reach speeds of up to 1.9 Gigabytes per second. The router uses amplifiers to boost the wireless signal, so it will be more powerful and reach farther into your home. The Beamforming technology will create better and more stable connections with the wireless clients, increasing the performance. The device is easy to use thanks to the NETGEAR genie app. The app allows you to monitor and control the network using a remote device, and allows other devices to connect to the network with ease. Using the app will also allow you to block or allow access to certain wireless clients. The Parental Control feature is also easy to use, and you will be able to set online boundaries. The app is compatible with Mac, Windows, IOS and Android devices. 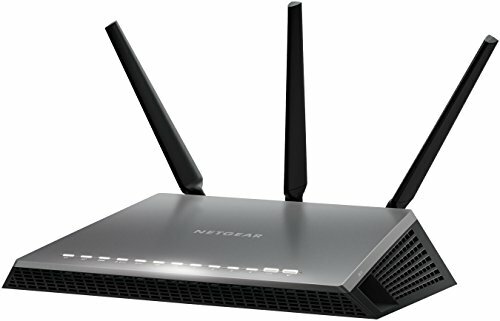 The NETGEAR Nighthawk AC1900 DSL modem router combo might cost more than other models, but it will deliver the best Internet speed if you have a VDSL/ADSL connection. This is a device that will get the most out of your Internet plan. Easy To Use App - The app makes everything easier, from installation to Parent control and remote access. Signal Amplifier - The signal amplifier will transmit the Wi-Fi signal farther into your home. Not Compatible With Some Antivirus Software - If you use a Kaspersky antivirus product, you won’t be able to run the installation wizard. This can be solved by installing the modem using another device. This modem is designed to work with ADSL connections. It is compatible with all the major DSL service providers, but it’s not compatible with all the packs they offer. Make sure you check with your service provider to see if the device is compatible with your Internet plan before purchasing it. With a preconfigured setup, the modem will automatically detect your Internet service settings. Once it detects the service provider, the installation wizard will connect the modem to the Internet in a couple of minutes. The modem has an 802.11n build. The Wi-Fi network provides transfer speeds of up to 300 Mbps. The router comes with a WPA/WPA2 wireless encryption and a customizable firewall for increased protection. This is a small and efficient ADSL modem router. It’s not flashy, and it doesn’t have many additional features, but it’s reliable and reasonably priced. 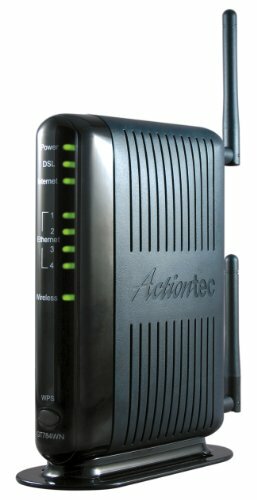 The Actiontec 300 Mbps ADSL modem router is a budget choice for people who have an ADSL Internet plan. While it doesn’t offer a lot in terms of Wi-Fi connection, it will still outperform the device rented out by your ISP. Easy Setup - This device has a built-in installation wizard which is easy to use. The installation will be over in a matter of minutes. Good Range - Even though the unit is smaller and more compact than other models, it’s still capable of covering a large range. Not Compatible With Some ISP - This product is not compatible with some ISP, so make sure you call yours and check before buying it. If you’ve made up your mind about replacing the cheap modem your Internet service provider rents you, it’s better to familiarize yourself with the basics of how the best modem router combo devices work. Most people are by now familiar with both terms, but they don’t really know what the difference is between them. Both devices are commonly used in homes and offices every day, but even if they look similar at a glance, they work differently. In fact, they serve different purposes altogether. A modem is a device that allows a client to connect to the Internet. It acts as a bridge between your ISP and yourself, allowing you to use their services. Every modem uses an Ethernet or a phone cable to connect to the Internet, but that’s about all it does. It does not distribute the new connection to other clients. Unlike the modem, the router cannot create a connection with your ISP, but it can distribute it to all the devices at your disposal. You might remember the old routers as those devices full of Ethernet cables connecting computers and printers. New models offer Ethernet connections, but most of them rely on a good Wi-Fi connection nowadays. As you can see in the previous section, you need both a modem and a router to connect to your ISP and distribute the connection with other devices. Most people are paying a rental fee of up to $120 every year for a modem. Unfortunately, the rental modem your ISP is providing you is usually not that good, and it’s actually slowing down your Internet connection. Some companies have adapted to the new demands of their clients, and they are already providing a device that acts both as a modem and a wireless router. Unfortunately, we’ve yet to discover an ISP that provides a good modem router combo. They usually buy the cheapest available device in bulk, so they will lower their expenses. This can lead to connectivity problems because the device can have problems connecting to the Internet, or it can distribute the connection unevenly throughout the house. This is where using an efficient modem wifi router combo comes in handy. As a matter of fact, using one will have several advantages. It’s cheaper to use one device instead of two. Even though modems and routers are usually not large consumers, using a single device will still lower your electricity bills. All the devices we tested and included in our list outperform the ones you might rent from an ISP. They offer a faster and more stable connection to the Internet. If you rented a router, you already know that the signal can be weaker in one part of the house or another. This can be a problem of the past if you upgrade to a good modem router device. Most of the models we included in our list have a larger range, so there will be fewer weak or blind spots. No, this is not a line taken straight from an infomercial. This is mathematics, clear and simple. If you’re paying a rent of $86 (sometimes it can reach up to $120) every year, and the device costs $150, it will pay for itself in a little under 2 years. Most modems you can rent from your cable service offer a 8 x 4 broad connection. While this is still a good connection for most household users, it can become crowded at times. Having a broader connection will allow you to browse the Internet without lagging or waiting for the movie to buffer. Even though modems and routers don’t usually take up much space, using a single device to do both jobs will make your desk look bigger. Some devices have a tower design to further limit the space they take. If you spent some time browsing for modem routers online, you definitely noticed that every model has some special features. Now you might be wondering, which of them are good, and which are useless? Should you spend your money on these features, or are they good only as a marketing strategy? This feature is now used by most manufacturers. The reason behind this growth in popularity is its effectiveness. Dual band wireless networks work. They offer real benefits. And it makes sense if you think about it. Unlike the place you used to live in ten years ago when you first started using a Wi-Fi router, your home is nowadays full of wireless devices. From smartphones to laptops, PCs, consoles, refrigerators, vacuum cleaners, washing machines, and smart TVs, they all need and use a Wi-Fi network. And it’s not only your devices we’re talking about, it’s your neighbors as well. A wireless network which uses a single Wi-Fi band can get a little crowded. Even if your neighbor doesn’t use the same network, his or hers network will produce the same 2.4 GHz frequency. When the frequency is crowded, some connectivity issues might appear. You might not notice them at first, but as you use more and more wireless devices, you will notice a small delay between your command and its execution. This is where a second band comes in handy. The advanced devices, like tablets, PCs, laptops, smartphones, and consoles will be able to connect to the second band with a frequency of 5.0 GHz. Not only will this clear the first band, but it will also allow them to connect quicker to the Internet, increasing their performance. Most manufacturers use this feature, even though they have a different name for it. Is it any good, though? The theory behind this feature is that if a wireless client is constant and stable, the router will make the connection better. Does any of this make sense? Think of it this way. A wireless router produces and distributes the Wi-Fi in an area around it, usually in a circle pattern. Instead of doing that, the focusing technology will transmit the wireless signal directly to a client that uses it as well. This will increase the amount of data shared between the router and the device, increasing the Internet speed and performance. If the devices don’t have the focusing technology, they will still receive data from the router in the old fashioned way. Most smartphones, laptops, PCs, tablets, consoles and smart TVs are already using the technology. This is a technology used by some manufacturers. They developed a booster which will increase the router’s signal. This will allow the Wi-Fi to reach farther into your house, so there will be less weak spots. This is a good feature to have, especially if you install the modem router combo in a large space. The remote device app is a great feature to have if you’re one of the people who constantly check their data plans and network status. The apps allow you to control the network remotely, so it will be easier to monitor and control the network. However, if you’re one of the people who doesn’t check on their network status after they install it, the app will be useless for you. It would be better to have a simple installation software. Many people tend to place their modem routers close to their desktop computer if they have one. Some people will place the device on their desk even though they own a laptop. While this might help with your computer’s connectivity, it can be problematic for other wireless devices. The best thing you can do is to place the modem router in a central position. Keep in mind that the Wi-Fi signal is affected by walls, so make sure there is clear space all around the router. The signal can also be affected by some environmental factors, like windows, mirrors, and steel, so place the router away from them. There is no general answer to this question. Every device has its own installation process. Some of them have a preinstalled software which will run automatically once you connect the device to a power outlet and a laptop or computer. Others can be installed using an app. 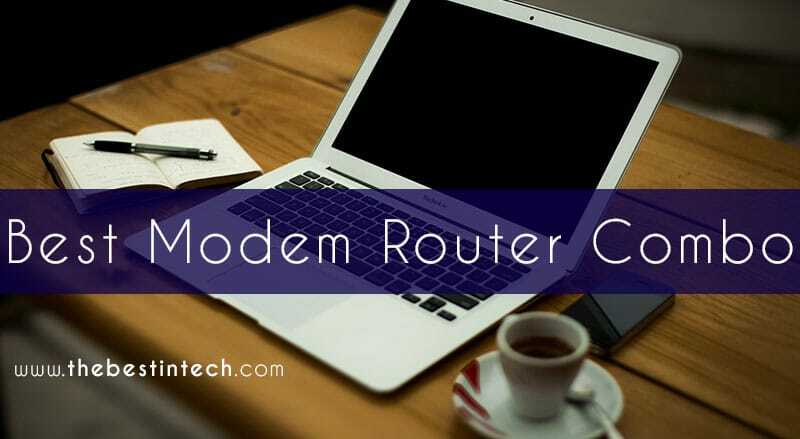 Most apps are compatible with many operating systems, so you will be able to install the modem router directly from your phone or tablet, without having to connect it to a laptop. Lastly, some of them come with installation CD-s. Even though the newer models don’t use a CD any longer because many modern laptops and tablets don’t have a CD-Rom, you can still find models that do. Many people are reluctant to buy a modem router because they fear their investment will not be justified. Most modem router devices will last for at least 2 – 3 years if you won’t drop or physically harm them. Some people have been using the same device for more than 5 years without any problems. Even if a new Internet speed technology will be available soon, it won’t affect most users. It will only affect those who have the fastest Internet plans available, and those users will only need a new device if they want to increase their speed. Most devices pay for themselves in under two years. If you’re worried the device will break before it gets the chance to pay for itself, look for a model with an extended warranty period. Some models come with 2, even 3-year warranties. Nonetheless, there will come a time when you will have to change your device. Whether it’s because a new technology appeared, or because it’s physically damaged. You should always make sure your modem router’s firmware is up to date. This will make the router perform at its top capacity. However, you shouldn’t check for updates every day. Most manufacturers release new software updates only once or twice each year. In order to update your device, you have to log on using your username and password. You should find the software update option in the control panel. After updating the software, the modem router will automatically restart. Buying separate devices for a router and a modem is a thing of the past. The best modem router combo devices not only do both jobs well, but they actually outperform most separate units. Many people spend large amounts of money renting out a modem and a router from their Internet service providers. Some of them even spend money to rent out a modem router combo, and they are always complaining about the poor Internet quality they’re receiving. Internet providers usually rent out outdated units just to make a profit, so if you want to reach the whole potential of your Internet plan, you should invest in a good modem router device.